Brain-based assessments that define what quadrant of the brain dominates and how you interpret the world. Emotionally-based assessments that demonstrate how emotions influence behavior. Psychologically-based assessments that identify the needs that must be met in order to feel psychologically secure. Socially-based assessments that show how you behave and how others perceive you as behaving. It provides you with an in-depth understanding of your own brain's organization and how to leverage its full capacity to achieve your potential. Identify your Predominant Striving Style and your Striving Style Squad and learn about the predominant need that drives your behavior. The forced-choice questionnaire takes approximately 20 minutes to complete and provides you with a 26-page report on your Predominant Striving Style and Squad. It also includes your equivalent Jungian functions results (e.g., Extraverted Feeling with Sensing) and personality type four-letter code (e.g., INTP). Please note: To open up assessments on mobile devices you will need an PDF reader app. 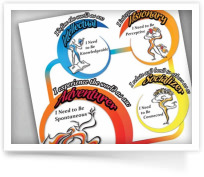 Learn about your child’s predominant need and Striving Style Squad with this assessment and 26-page report, specifically designed for 6-12 year olds, that lets you to parent more effectively. Questions relate to a child’s experiences and the comprehensive report includes a special section for your child to understand what it means. For children under 6, parents can complete the assessment based on their observations. A highly detailed analysis of your Striving Style and Squad available only through a SSPS Licensed Practitioner of as part of an interpretation session. A comprehensive exploration of the brain’s dynamics and dysfunctions based on the under-use of the Associate Styles or the overuse of the Predominant Style.